L.A. Larkin writes fast-paced conspiracy thrillers often with an environmental focus. After the success of The Genesis Flaw L.A. Larkin gave up her climate change consultancy role, and now divides her time between writing thrillers, her public speaking engagements and running thriller writing courses both in the UK and Australia. She lives in Sydney. The History of Blood by Paul Mendelson. Set in modern day South Africa, it has a great murder mystery at the heart of the story and a fascinating central character in Colonel Vaughn de Vries. I heartily recommend it. I love all libraries and am a huge supporter of them. Having done an event at the brand new Double Bay Library, I think it is a wonderful example of how libraries can serve their local community, both young and old. I’m also a fan of the Brisbane Square Library because of the events it hosts, and also the Arana Hills Library because of the wonderful people who work there. I once had a review in The Age that said, ‘And yes the author is a woman. Such is the tone and dedication to action, I really did think Larkin was a chap.’ I actually take that as a compliment, because action thrillers are mainly written by male authors and the book the reviewer is referring to, Thirst, had a male central character. If you want to write novels for a living, focus on writing the best book you possibly can, and don’t let early rejections by publishers get you down. If JK Rowling and Stephen King had given up after a few rejection letters, our literary world would have been a much duller place. If you could replay a moment of your life over and over again, what would it be? Yet again, I am going to cheat and say two moments: the day I married Michael and the launch party for my first published book. What inspired you to write Devour? 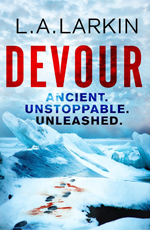 My latest thriller, Devour, was inspired by real events in Antarctica in December 2012. A British expedition led by Professor Martin Siegert, aimed to drill down through three kilometres of ice to reach a subterranean lake, known as Lake Ellsworth. They believed that in that lake, cut off from the rest of the world for centuries, living in total darkness, they would find life, never before seen, known as ‘extremophiles’ because they can survive such hazardous conditions. Sadly, the Lake Ellsworth team did not manage to reach the buried lake and called off the expedition. But, the question remains: what if there is ancient life down there? And for me as an author the big question is: what if there were catastrophic consequences if it was brought to the surface? This is the premise of Devour. Want to know more about Devour? Their greatest fear was contaminating an ancient Antarctic lake, buried beneath the ice for millions of years. They little knew the catastrophe they were about to unleash. From the poppy palaces of Afghanistan and Antarctica’s forbidding wind-swept ice sheets, to a top-secret military base in the Nevada desert, Wolfe’s journey will ultimately lead her to a man who would obliterate civilisation. She must make an impossible choice: save a life – or prevent an unspeakable horror. Inspired by events in Antarctica, Devour is book one of the Olivia Wolfe Thriller Series. The next novel is Prey.